The file hosting service tweeted a picture that largely featured white people as part of a diversity message. Dropbox just posted a picture on Twitter to showcase its diversity. Only problem: The image only features light-skinned staffers. 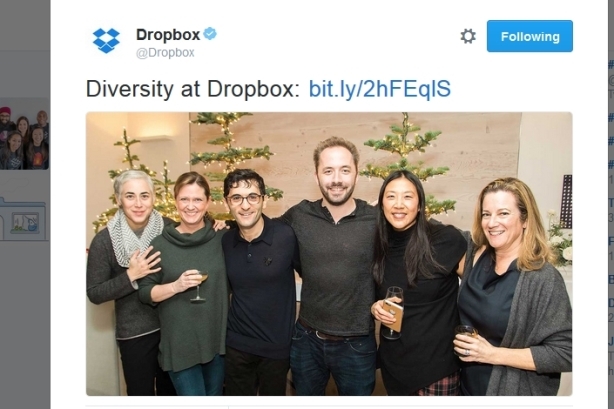 The image, posted alongside the text, "Diversity at Dropbox," has Twitter users scratching their heads. Included in the Dropbox tweet is a link to a blog post that does actually illustrate the company’s diversity efforts – in great detail. The blog explains that, this year, the file-hosting service has continued to invest in programs that help attract and retain diverse candidates. Out of the new hires this year, 35% are women—up from 28% last year; and 41% are from minority groups—up from 41% in 2015. Dropbox also lists key programs it has created to foster a diverse workforce. These figures and programs, however, took a backseat to the photo Dropbox included in the tweet, which was posted around 1pm ET on Wednesday. Outrage ensued. Comment after comment on the tweet questions the company’s decision to use that particular photo. Most Twitter users are making fun, but some are calling for Dropbox to fire its marketing team. Others are deleting their Dropbox app in response. Dropbox’s gaffe echoes Starbucks’ Race Together controversy last year. As part of that campaign, which invited customers to talk about race, the coffee chain used only white hands in related photos. This is yet another reminder that images matter -- especially when communicating about a topic such as diversity. @Dropbox Unless u r going for gender this seems a of a bit awkward picture! Else to me this image just says "Oh there is an asian person!" @Dropbox to me it says "we even have a guy with glasses". @Dropbox You need to reconsider whoever approved this. @Dropbox I want you all to be aware that I read the article too and have been a user for years. This is by and large, very disappointing. A version of this story first appeared on PRWeek.